This week’s storytime was all about fish. There are so many great fish books out there, it is hard to pick just a few for storytime. We started with Smiley Shark by Ruth Galloway. This is a fun story about a shark who scares away all of his potential friends with his huge smile. Luckily, they learn the value of having a friend like him and they end up being friends. This is a fun book to read in storytime because the kids always think the shark is going to be mean, even though the title clearly states that he is smiley. It always leads to a fun discussion. Next we read Bright Stanley by Matt Buckingham. This is about a little fish named Stanley who loses his friends. That seems to be a theme with fish books. Anyway, he is shiny and bright and that helps him find them. This is an exciting book to read just because of the foiled scales on Stanley, the kids really like that. It’s in the same vein as the Rainbow Fish books by Marcus Pfister. We only read two books today because we played some games and also did a fun flannel board. 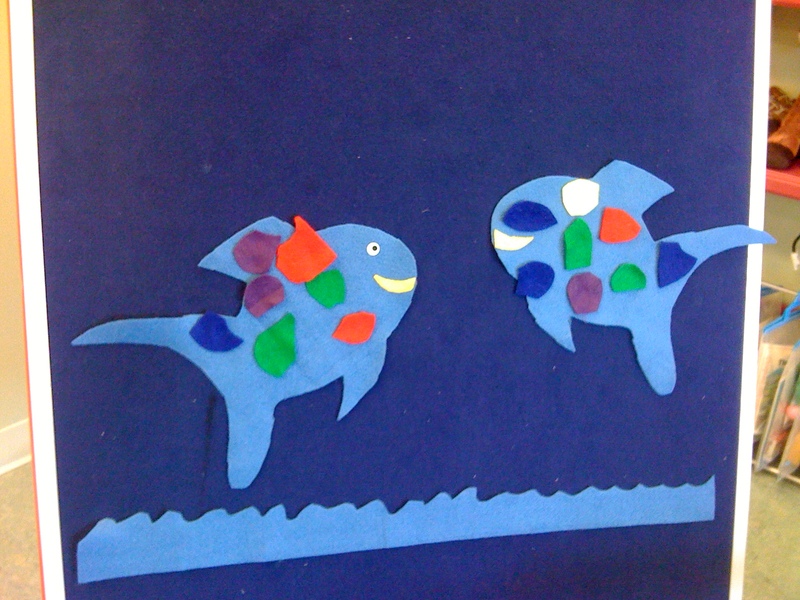 I gave each child a different color piece of felt and they added it to the fish on the board. I have done this before and everytime it’s a huge success. I call out the colors by name so they have to identify what color they are holding and then get to come up. Our craft was a similar idea. They had to put scales on fish. 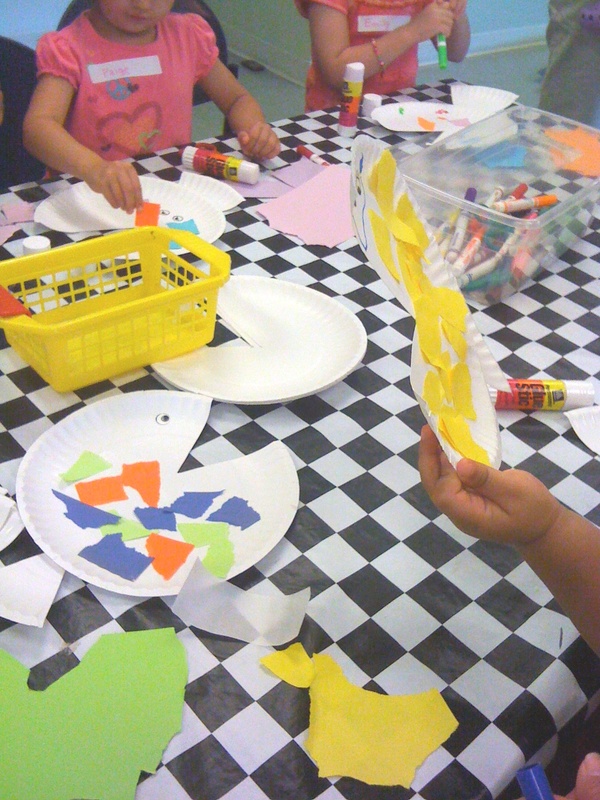 This craft is very much like the craft I did for a previous fish storytime except this time I used a paper plate and they tore the scales from paper. I don’t know which one was more popular. They both worked great! The picture isn’t the greatest of the actual craft, but this is the best one I was able to get. You can see the paper plate fish on the left. My favorite part of the picture is actually hard to see. One of my favorite storytime kids (who am I kidding, they are all my favorite!) made an all yellow fish, you can see it on the right. He told me it was his own Stanley to take home. The same child came up to me prior to storytime and said “I AM SO EXCITED FOR STORYTIME MISS SARAH!!! !” It melted my heart. And that, my friends, is the perfect example of why I have the absolute best job in the whole world.